It always more fun when kids are around.. to prep the foods and make them from scratch. You may be surprised.. but kids like to eat something that they can be proud that they made themselves.. and if nothing else it was a learning experience! I was so happy when one of my friend’s daughters wanted to help me out. Raw vegan food takes time and prep. This is the problem folks! No one has the time.. or makes the time. I promise you this though- you can make health a priority now… or health will make you a priority later. We prepped our cashews the night before. Now it was time to MILK THE CASHEWS!!!!!!!! First we drained the soaked nuts and then RINSED them well! My Sous Chef Kayla added water just over the amount of nuts by about 2 inches. 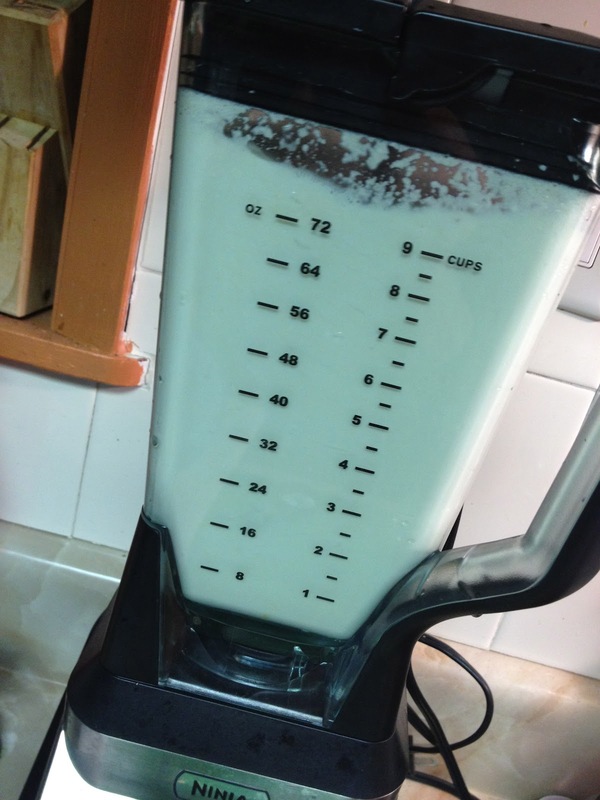 She blended and we both tasted it. Since I was making it with her.. and she is an 11 year old trying out vegan food.. I added some maple syrup. It really didn’t need much! Other things you can add for sweetening would be dates or figs. I have done both with almond milk in the past. I have never made cashew milk. We were both amazed as we blended it into a creamy white texture that closely resembled dairy milk. Wow we did it ourselves… no cows or suction cups.. or pus, hormones, antibiotics or GMO feed. Ok.. I admit we could have used gloves.. but we were experimenting.. we were drinking it.. and it was FUN! This step here is where those gloves would have come in handy: MILKING THE CASHEWS! You can’t just drink it from the blender (well.. maybe) because it’s gritty! 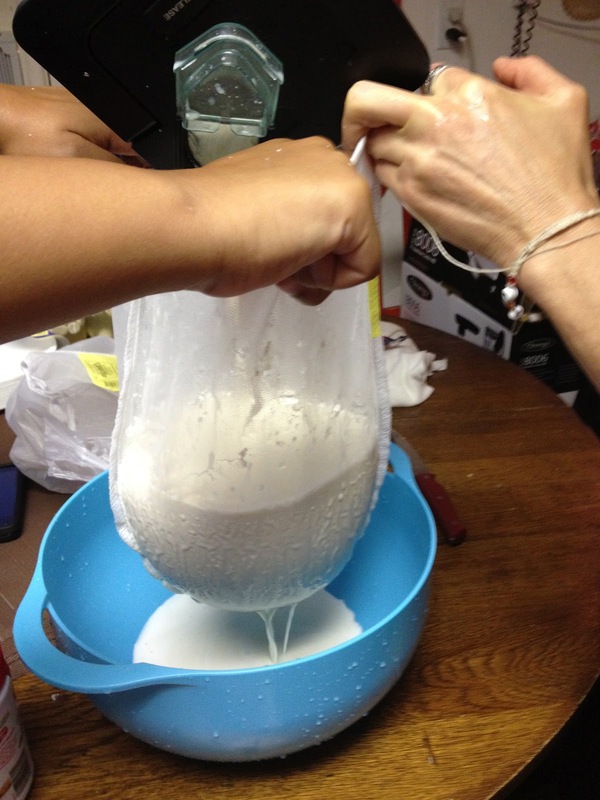 So here we squeeze the milk out through a milk bag… or in this case… a paint bag. I always heard you could use a paint bag and I finally gave in and tried it- super! I am a messy bartender at work … and a messy chef in the kitchen. I wanted to make the shakes first.. clean second. Even my little sous chef was nervous about that and wanted to clean. lol Anyway- we made her shake first without the protein powder. 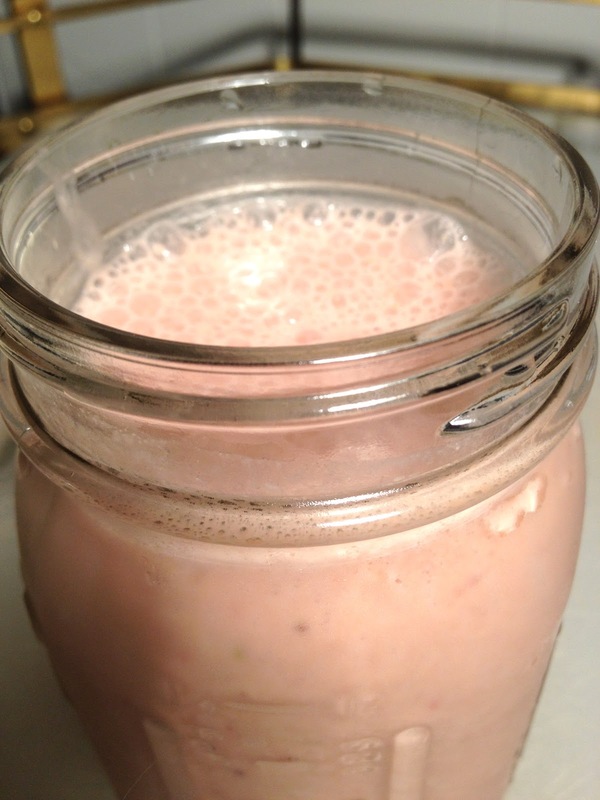 Kayla had the fresh cashew milk with bananas and strawberries. Next up was my special raw vegan meal of the day: Sun Warrior RAW VEGAN PROTEIN POWDER mixed with cashew milk, banana and strawberries! ALL DONE! We even had 2 small mason jars of cashew milk for the next day! Check in tomorrow to see what we did with the macadamia and pine nuts!